Gary Rishel ’72, left, and Tony Rohloff ’87 are pilots with Delta Air Lines. They met during a training course where they realized that they are both RIT graduates. 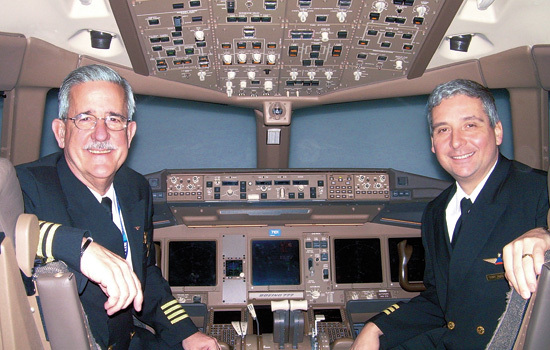 Captain Gary Rishel and First Officer Tony Rohloff were chatting one day while training to fly the Boeing 777. Rishel asked Rohloff where he went to school. Rishel ’72 (business administration) and Rohloff ’87 (applied mathematics) spent the month-long training course together about two years ago. They are both pilots with Delta Air Lines. A week after graduating from RIT, Rishel was in aviation officer candidate school in Pensacola, Fla. In the Navy, he flew the P-3 Orion and served two deployments—one to Keflavik, Iceland, and one to Sigonella, Italy. He has worked for Delta Air Lines for 30 years. Rohloff also started his flying career in the Navy, flying the A6-E Intruder off the aircraft carrier USS Theodore Roosevelt. He then became a fighter pilot in the Air Force. He served two combat tours, one to Iraq and one to Bosnia. He has been with Delta Air Lines since 1997. Rishel now flies out of Atlanta and Rohloff is based in Detroit. They both fly to Sydney, Hong Kong, Shanghai, Frankfort, Tel Aviv and Dubai. Once on a layover in Dubai, the two pilots ran into each other. On another layover, Rishel, who is married to artist Sarah Shanahan Rishel ’73 (fine arts), visited RIT Dubai wearing his Tiger hat. Rohloff says during the training course he and Rishel also discovered they were both from Buffalo and knew some of the same people. They reminisced about how their alma mater has changed and is getting an international reputation since their years on campus.